"Get a life, Amanda"..... I heard that phrase many times throughout my marriage to Jim. “Get a life” was his way of chastising me for being too dependent on him, too needy. The irony of it was that I depended on him for very little. I learned early on that when I needed him most, he was unavailable. Each time he hurled those words at me, my response was always the same: “Someday I will. And you won’t be in it”. He didn’t believe me. When I fell in love with Jim and accepted his marriage proposal, I told him my dream was to have an uncomplicated life, filled with the same passion and devotion that surrounded me throughout my childhood. I wanted my children to feel loved and protected so that one day they would look back and have fond memories of their own childhood. Jim assured me that he wanted that also. He promised me a life of love and affection, friendship and laughter. He lied. 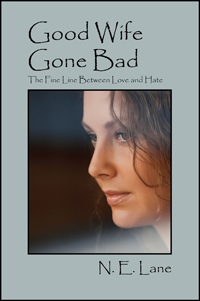 “Good Wife Gone Bad” addresses serious social and emotional issues being dealt with in today’s society: infidelity, emotional and verbal abuse, abortion, desertion and abandonment, rage issues, anxiety and panic disorders, post-partum depression, and divorce. The writing of this book was a collaboration of efforts. Amanda has a permanent injury that inhibits her ability to use a keyboard or hold a pen for long periods of time, but she felt she had a story to tell. Her husband, Neil, put her story in print. Amanda and Neil are currently living in Virginia and enjoying the freedom of retirement with their family and friends.